First off, there are a couple of short videos we have recently added to our 'video page' on the topic of sharpening. 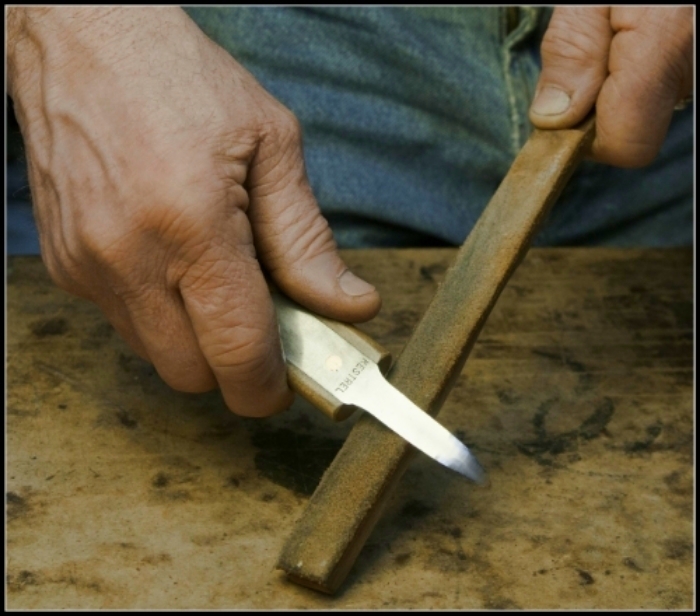 Gregg explains the basics of sharpening a straight blade, crooked knife, and adze. Check it out, it may help you. We want you to be happy with the tools you buy from us. Having tools out there that are hopelesssly dull are a negative advertisement for us, and no fun for you. Every carver needs to hone their honing skills, but there are times when a tool gets dropped or gets trashed because your five year old tried it on concrete or, the tool simply gets beyond ordinary maintenance. At this point we suggest you put it (them) into a box, including cash or check for return postage, and ship them off to us. We will edge the tool(s) up for you and return them right away. If the work is reasonable and ordinary we will do this for free. If the tool has been severely abused, comes back without its guard, covered in rust, etc., we will fix things up at our shop rate of $90 per hour. That may sound pricey, but you will not believe what we can do in 10 minutes, sometimes several knives, so don't worry too much about the cost, it most likely will not be much, lest you have a huge pile of really badly beaten blades. At any rate its a lot cheaper than buying new tools! And remember, if they've been cared for and you pay for postage, we'll hone them razor sharp for free! We want to help you stay carving! Please contact us first for an estimated price and so we know how many/what to expect. Thanks! There are many carving programs in schools, colleges, and tribal programs that order sets of tools from us. We have heard of more than one circumstance where a program stops for the lack of sharp tools. Come on folks, get those tools boxed up and send them to us. For a fraction of the purchase price you can have tools with razor sharp edges for each class. If you can send the tools in when you will NOT be using them for 10 days or so, that will allow us to fit them into our schedule. With proper techniques and equipment, yes, you CAN sharpen your own tools. Some great sharpening equipment is for sale below. Carvers must find a system of sharpening that works for them. The best carvers all have one thing in common—their tools are sharp! Some use Japanese water stones and others aloxite cloth on a dowel. If you learned how to sharpen with these methods stick with it—if not, I suggest you try the products we sell. I had a pretty experienced carver say to me recently “I never realized how dull my tools were until I tried your stones.” I am please with this selection of sharpening aids. I really stand behind the Spyderco and Ultra-Tec; if you can find better sharpening products let me know and I'll get them. These are manufactured sapphire, next under diamond in hardness. You can cut hard Arkansas with these ceramic files. Spyderco stones can't be compared to other ceramics. High quality, they cut fast and leave a polished edge. The factory recommends cleaning a dirty stone with a Scotchbrite pad and water; I use a bar of Lava soap. The Teardrop Slipstone tapers from 1/4″ to less than 1/8″ in 1/2″ width. With its flat area and two different radii, it is a very useful stone. The fine grit cuts like India but leaves a polish like hard white Arkansas. #400F1SP Fine Grit, 5″ x 1/2″, teardrop cross-section $23. Here's a pic of all the sharpening supplies we sell on this page. A strop is a must for edge maintenance. I use no abrasives when stropping as I feel the leather is abrasive enough. Using stropping compounds does bring up an edge faster, but it also rounds it off, making stoning and, ultimately, edge maintenance more difficult. The leather overhangs for stropping our tools. Make your own strop, it's easy! Glue with rubber cement to a 3/8″ thick board a little narrower than the leather for stropping the inside of crooked knives, etc. Dimensions: 1 1/8″ wide x 7″ long. Highly refined light oil for use when sharpening. Keep a bottle in the tool box.